George sez, "Kevin Kelly describes how Robert Heinlein dealt with fan mail before PCs." 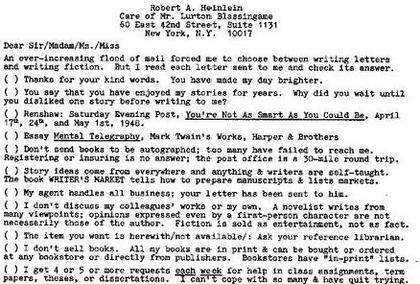 Heinlein engineered his own nerdy solution to a problem common to famous authors: how to deal with fan mail. In the days before the internet, Heinlein's solution was fabulous. He created a one page FAQ answer sheet -- minus the questions. Then he, or rather his wife Ginny, checked off the appropriate answer and mailed it back. While getting a form letter back might be thought rude, it was much better than being ignored, and besides, the other questions you did not ask were also answered! Indeed, it is both remarkable and heartwarming that Heinlein replied at all to most mail. Can you imagine other great authors doing the same -- even with a form letter? Heinlein's form is very entertaining to read because you are forced to reconstruct the missing requests.